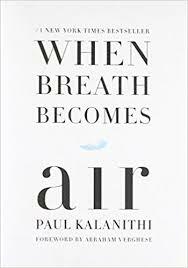 When Breath Becomes Air by Paul Kalanithi was an excellent and profound book by the late neurosurgeon who died from cancer in March 2015 and is survived by his wife and their young daughter. Kalanithi grew up in a family that heavily valued education and after they moved from the Northeast to Kingman, Arizona, his mother got a college prep reading list for her children and Kalanithi at ten read the book 1984, then others such as The Count of Monte Cristo, Robinson Crusoe, The Last of the Mohicans, and Don Quixote, developing a love of literature. He attended Stanford, completing degrees in Human Biology and English Literature, and went through Medical School at Yale.